Kofi Atta Annan, born on 8 April 1938 in Kumasi, Ghana, served as the seventh Secretary-General of the United Nations (UN) between 1997 and 2007. As a young man, Annan finished his undergraduate studies in economics at Macalester College in St. Paul, Minnesota in 1961. He then completed his graduate level work, also in economics, at the Institut universitaire des hautes études internationales in Geneva, Switzerland from 1961 to 1962. Annan returned to the United States, and earned a Master of Science degree in management in 1972 at the Massachusetts Institute of Technology (MIT). Annan fluently speaks French, English, and a number of African languages. Kofi Annan joined the United Nations in 1962 when he went to work for the World Health Organization. Since then he has been involved with the United Nations in a number of different branches, including the UN High Commissioner for Refugees and the UN Emergency Force in Ismailia. Annan was assigned to UN Headquarters in New York where he worked with issues ranging from human resources management to peacekeeping. On January 1, 1997, Kofi Annan became the Secretary-General of the United Nations. He served a second five year term beginning in 2002. 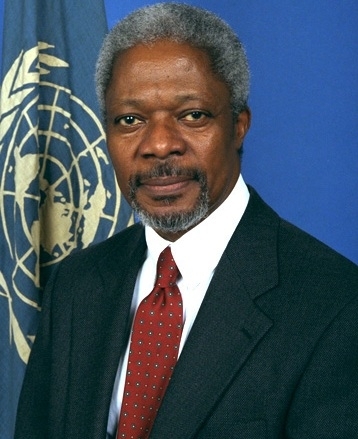 Annan is the first Secretary-General to have been appointed from a UN staff position. In 2005, he helped establish two new bodies within the UN; the Peacebuilding Commission and the Human Rights Council. His involvement with peacekeeping is vast, as he has played key roles in a number of international negotiations. In 1996, he facilitated negotiations with Baghdad, Iraq in regards to their oil sales as funding humanitarian relief. In 1999, he played an important role in helping ease tensions between Libya and the UN Security Council, During the same period he also persuaded the international community to focus on the violence that was occurring in East Timor. Two years later, in 2000, he helped facilitate Israel’s withdrawal from Lebanon. Annan’s years at the UN have focused on creating relationships between the organization and citizens and non-governmental agencies. Such relationships which marked a sharp departure from the UN’s prior emphasis on government to government cooperation, have allowed the international organization to address new concerns such as environmental sustainability, human rights, global poverty and inequality, stopping the spread of pandemic diseases, improving education, and fighting global terrorism. In 2001, Annan jointly won the Nobel Peace Prize, for his peacekeeping work, with the United Nations. He has additionally received several honorary degrees and numerous other national and international honors. James Traub, The Best Intentions: Kofi Annan and the UN in the Era of American World Power (New York: Picador, 2006); http://www.un.org/sg/formersg/annan.shtml; http://nobelprize.org/nobel_prizes/peace/laureates/2001/annan-bio.html.